Summer has arrived, Christmas is approaching and before you know it 2012 will be here! 2012 means New Year celebrations and the Melbourne Food and Wine Festival. Please read on to discover our next adventures and Christmas and summer wine ideas. 1. DiscoverVin and the Melbourne Food and Wine Festival. We are partnering with our friends at The Commoner in Fitzroy to present “Sweet Discovery” a special dinner as part of the MFWF. This will be a wonderful opportunity to match our Jurançon wines with great food. Hope you can make it! Discover the richness and versatility of dessert wines through an eclectic menu matched with wines from Jurançon. Classic French food and wine combinations inspire the menu designed and prepared by Jo Corrigan and the team from The Commoner. Fine meats, terrines, and game will feature. Late summer produce, cheeses and fruit matched with a range of unique dessert wines. Petit manseng and gros manseng, the grapes indigenous to Jurançon in the foothills of the Pyrenees, produce dessert wines that will challenge traditional ideas of “stickies”. Imported by Victoria-based DiscoverVin, the sweet wines of Jurançon will be matched to enhance the flavours presented by The Commoner, with a menu based on produce from Red Hill farmers showcasing the flexibility of dessert style wines. Some classic matches and others might challenge your preconceptions. We are still excited about the recently arrived Bordeaux wines. Not one bottle was broken in transit. We have been happily sampling them and continue to be amazed at the quality of each. 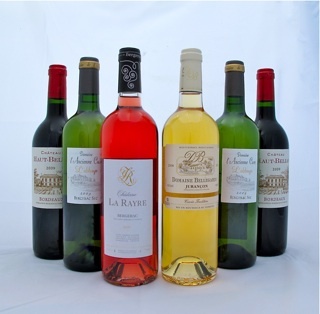 Descriptions of the wines and the appellations are now on our website. It has been great to re-discover the Château Haut Belian. At $19.90 it provides wonderful value for money. The two Pauillac wines (Les Tourellles de Longueville $69.00 and Château Pibran $69.00) would be ideal gifts or a wonderful Christmas drop. Festive reds. 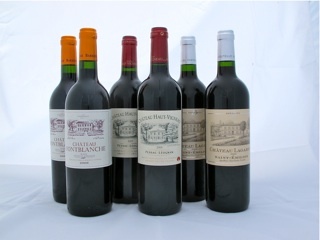 An ideal present for a lover of Bordeaux clarets or to open at the Christmas table or New Year BBQ. Three elegant Bordeaux clarets, from Saint Émilion on the Right Bank, Pessac on the other side of the Garonne, and from the Bordeaux Côtes. In preparation for “Sweet Discovery” you can order Jurançon dessert wines from our website. Vue de Monde have been serving Château Jolys Cuvée Jean as the finale at functions. Visit our website and order some for yourself. Just order any of our wines and you can add whichever gift box you would like at the checkout. But don't leave it too late! For Merlot, as it is meant to be try the Chateau Fontblanche, 2009, $22.00, or the Fleur de Clinet, 2008, $72.00 - this is the second label of the famous Pomerol producer Château Clinet. All prices and descriptions are on the website. Perfect for any summer occasion. 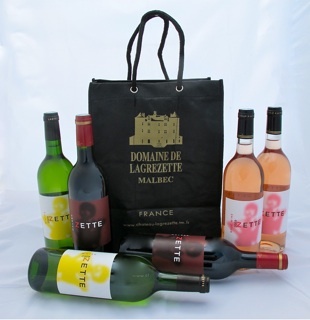 Six bottles of ZETTE and comes with a stylish Chateau Lagrezette carry bag (We know it’s stylish because the owner of Château Lagrezette, also owns Cartier). The pack includes 2 bottles of white, 2 bottles of rosé and 2 bottles of red. Throw them in the car as you head to the holiday house or favorite camping spot. You will be prepared for any holiday occasion! Or stay at home and drink them anyway! You can't go wrong with these 3 value for money, easy drinking, modern French wines from master producer Domaine Lagrezette. They won't break the bank but will definitely impress. Christmas Day in a Box - Three Wine Selections to help take the Stress out of your Christmas preparations. Christmas lunches and dinners are a great time to drink new wines with favorite recipes. What will you serve? Ham, turkey, pork seafood, prawns? Roasts or cold platters? Traditional Christmas pudding, fruit jelly, or a raspberry torte? While you arrange the menu, DiscoverVin present three versatile wine options, thoughtfully considered, to complement your meal. Go to the Mixed Packs section of our website for more details. Or phone (02) 6020 6016 for more assistance.